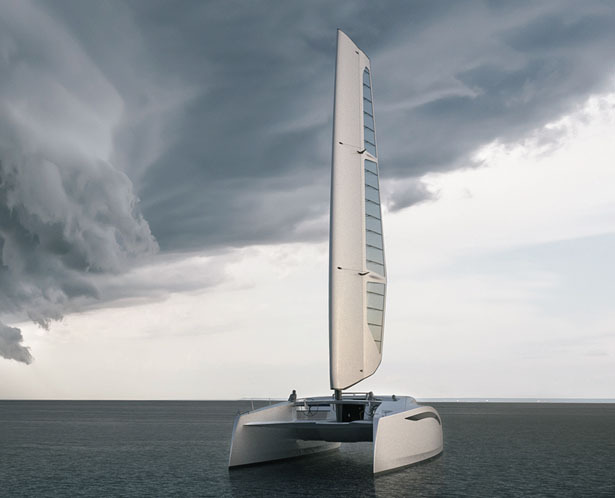 Zero Sail is an 18-meter concept sailing catamaran that allows 10 people to spend up to 3 weeks on the open sea. 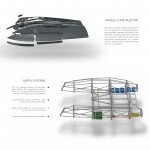 Using new technologies and a unique construction it offers a highly sportive user experience while still being sustainable throughout its whole lifecycle. 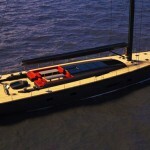 Available to a broader user group, Zero Sail is a charter yacht. Size and performance need to be manageable for hobby skippers without the help of professionals and still offer enough space for bigger groups. 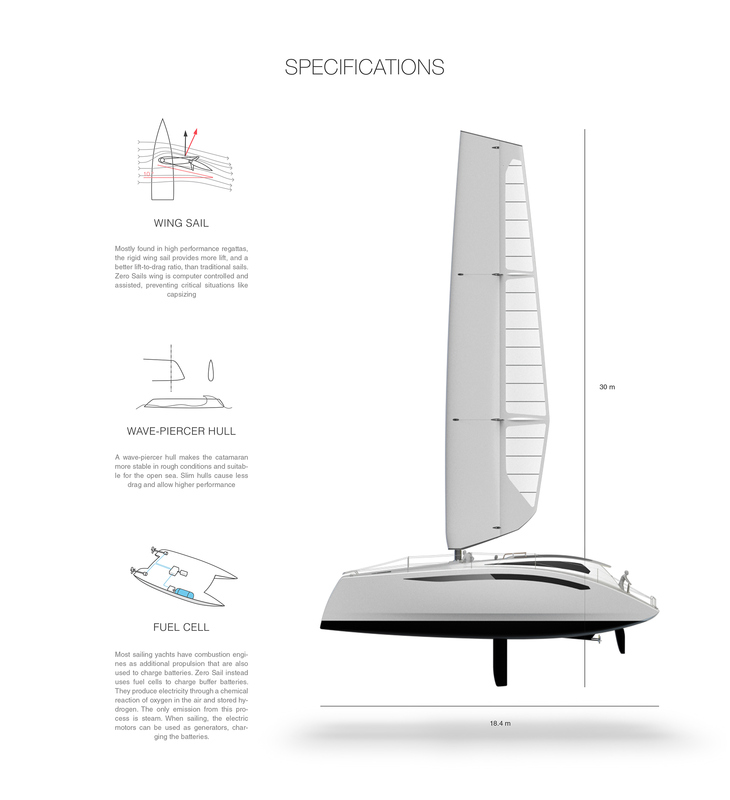 Even though designed as a charter yacht, Zero Sail gives the experience and felling of competitive sailing, many details have been inspired by modern racing catamarans. 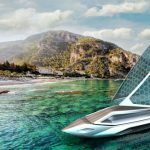 Using alternative materials and an emission free energy management system, Zero Sail has a holistic approach to sustainability. 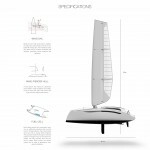 Most of the common sailing catamarans of this size are built out of barely ecological, non-recyclable materials like carbon fiber, glass fiber and epoxy. 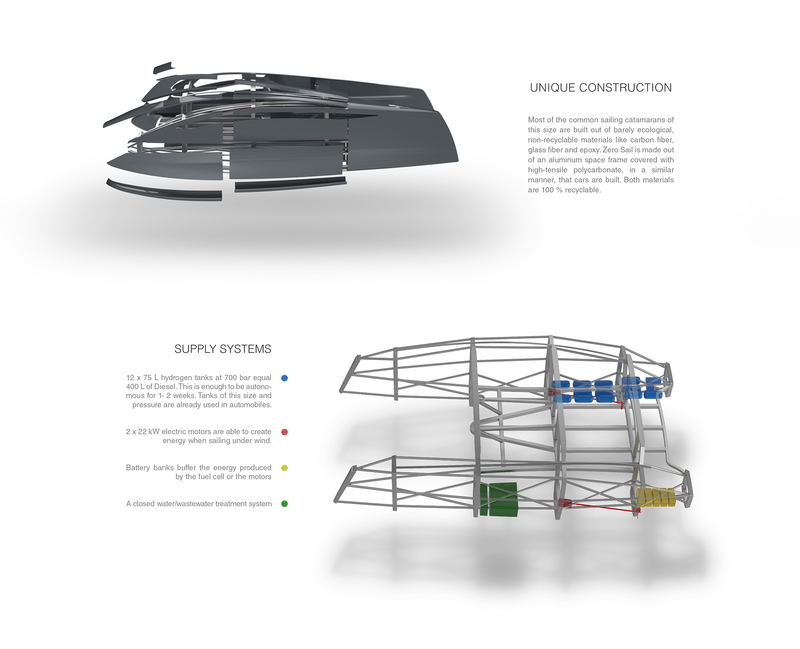 Zero Sail is made out of an aluminum space frame covered with high-tensile polycarbonate, in a similar manner, that cars are built. Both materials are 100% recyclable. 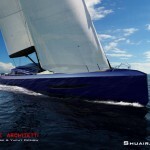 Unlike other sailing catamarans, the helm stand is placed in the front right beneath the wing sail. Here the skipper is exposed to the elements and has superior oversight. The crossbeam holds the wing sail and has an indicator that shows its angle. The living area is located in the back. It has a bright living space with huge panorama windows. 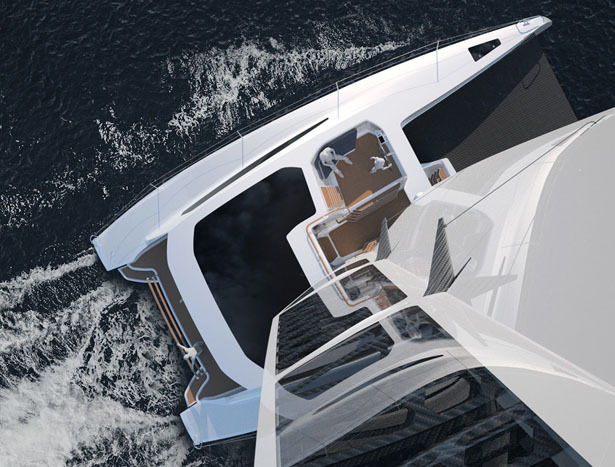 On the left of the balcony is the connection for charging the batteries and refueling the H². 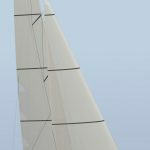 Mostly found in high performance regattas, the rigid wing sail provides more lift, and a better lift-to-drag ratio, than traditional sails. 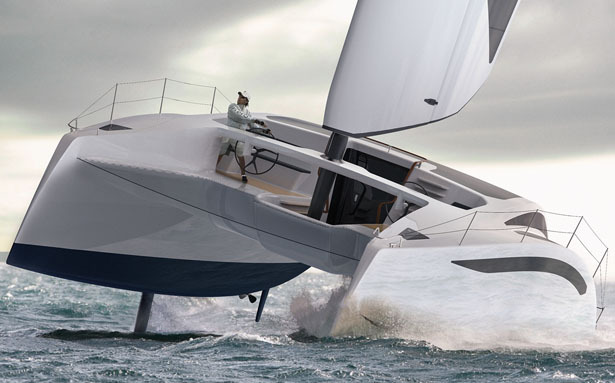 Zero Sails wing is computer controlled and assisted, preventing critical situations like capsizing. 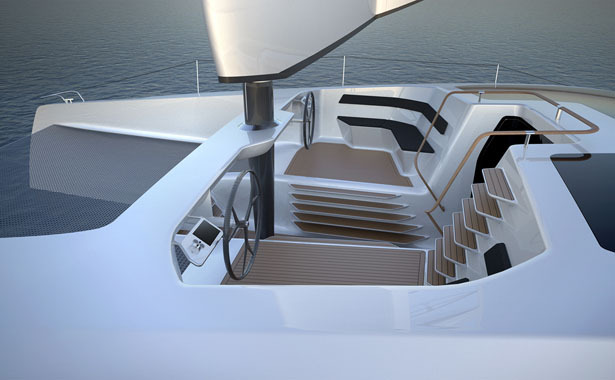 Most sailing yachts have combustion engines as additional propulsion that are also used to charge batteries. 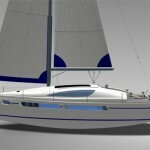 Zero Sail instead uses fuel cells to charge buffer batteries. They produce electricity through a chemical reaction of oxygen in the air and stored hydrogen. The only emission from this process is steam. 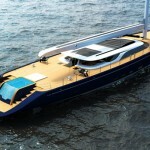 When sailing, the electric motors can be used as generators, charging the batteries. 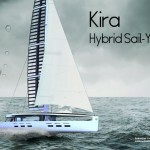 Tagged as 100% sustainable sailing yacht, modern catamaran design, modern sailing catamaran, modern yacht designer, racing sailing catamaran concept. 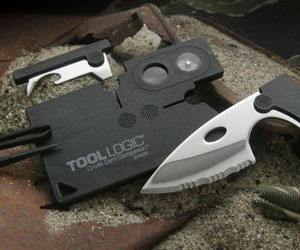 Very beautiful but zero practicality. You see, the cockpit is turn for the front. 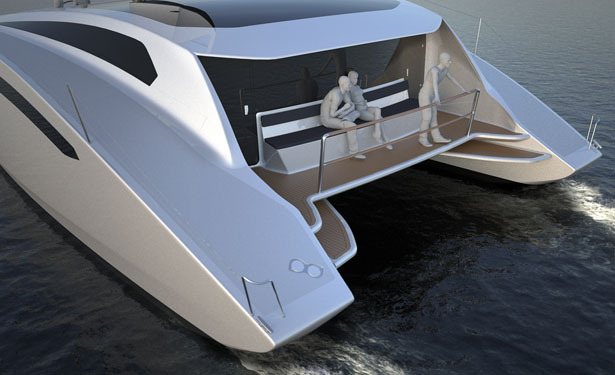 This will make it take water from the spray and any wave that hit the bow will get in to the cabin, and in the cockpit. 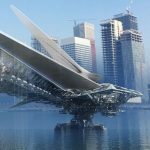 The crew will also be exposed to the elements.